Al-Zaytouna Center for Studies and Consultations in Beirut has published the English version of the Palestinian Strategic Report 2014-2015 (PSR). The PSR is one of al-Zaytouna’s most important academic studies, published periodically in both English and Arabic. Today, it can be surely asserted that PSR is a must reference for every researcher and academic who are interested in the contemporary developments of the Palestinian issue and the Arab-Israeli conflict. The PSR reviews biennially the various developments concerning the Palestinian question in a comprehensive, objective and academic manner. It offers a wealth of data, up-to-date statistics, and analyzes and offers an outlook of future events. The PSR 2014–2015, the ninth in its series, falls in 435 pages and seven chapters. Edited by Dr. Mohsen Mohammad Saleh, PSR 2014–2015 was written by 12 specialized researchers, and reviewed by four consultants. The Report covers the internal Palestinian situation, the Israeli scene and the Israeli-Palestinian relations. It focuses on the Arab, Islamic, and International stances towards the Palestinian issue, in addition to the issues concerning the Land and holy sites. In addition it analyzes the Palestinian demographic, economic, and education indicators. This section is the approved English translation of the study: “Israeli Settlement Expansion in the West Bank,” which is the second section of chapter six of the Palestinian Strategic Report 2014-2015, edited by Dr. Mohsen Mohammad Saleh. The Arabic version of this report was released in 2016 and the draft of this section was written by Dr. Ibrahim Hassan Abu Jabir. This section discusses the Israeli settlement expansion in the West Bank, Israel’s demolition of Palestinian homes, and the development of building the Separation Wall and its Impact on the Palestinian situation. It also reveals the continuing construction of bypass roads to dismember the West Bank. The author cites several reports to show the severity of Israeli attacks on Palestinian agriculture and water resources. The author concludes that the Israeli side is actively working to alter the identity of the land and the population, without regard to the peace accords it signed and its commitments to the PA, let alone international laws and conventions. He says that this will lead to the death of the peace process and the two-state solution and make the return of Palestinians to resistance in a broader and stronger manner likely. This study is the approved English translation of Jerusalem and Holy Sites, which is the first section of chapter six of the Palestinian Strategic Report 2014-2015, edited by Dr. Mohsen Mohammad Saleh. The Arabic version of this report was released in 2016 and the draft of this chapter was written by Ziad Bhies. This section discusses the Israeli aggression on Jerusalem and the holy sites, Judiazation process, and the various developments of the political, religious, and legal positions towards al-Aqsa mosque. In addition, it explores the increase in the representation of temple associations in the Israeli Knesset. It also explores the excavations and constructions under al-Aqsa mosque and in its vicinity, the Jewish presence inside the mosque and the interference in its administration. During that period, there was a systematic escalation in the Jewish demands regarding their entry into the mosque, while Muslim worshippers were suffering from constant harassment. This section discusses the Israeli aggression on Islamic and Christian holy sites in Jerusalem and in other parts of Palestine. As for the Separation Wall around Jerusalem and the infrastructure that reinforces the Jewish presence in Jerusalem, various development happened during 2014-2015. This study is the approved English translation of the part discussing Aggression, Resistance, Israeli Stand Towards the Internal Palestinian Situation, and the Peace Process, which is the third section of chapter two of The Palestinian Strategic Report 2014–2015, edited by Dr. Mohsen Mohammad Saleh. The Arabic version of this Report was released in 2016, and the draft of this section was written by Mr. Hani al-Masri. This section discusses the 2014 war on GS and its impact, the conditions of Palestinian detainees in Israeli prisons and the administrative detainees, in addition to Israeli blockade on Gaza Strip. As for the Jerusalem Intifadah, the author analyzes its causes and results. He also reports that in 2014 and 2015, Israel maintained its policy, or rather its strategy, in dealing with the domestic Palestinian scene, whether concerning reconciliation, the National Consensus Government, conditions in Gaza Strip, or the PA presidency. The last part discussed the 2014–2015 developments of the peace process, and its possible future scenarios, as well as the French position. This study is the approved English translation of The Israeli Demographic, Economic and Military Indicators, which is the second section of chapter two of The Palestinian Strategic Report 2014–2015, edited by Dr. Mohsen Mohammad Saleh. The Arabic version of this Report was released in 2016, and the draft of this chapter was written by the Editorial team at al-Zaytouna Centre for Studies & Consultations. This study discusses the development of population estimates of Israel, Jewish immigration and the number of world Jewish population. It analyzes the GDP and GDP per capita in-between 2009–2015, in addition to the various values of Israeli exports, imports, as well as the US annual aid. As for the military indicators, there were appointments and structural changes, and the drafting of females increased. Evasion, absenteeism, suicide rates and sexual abuse cases increased. This section discussed some Israeli military plans, explored the different military maneuvers and exercises executed 2014–2015, and the development of missile systems. At the end of this section, armament, arms trade, and the military budget were also studied. This study is the approved English translation of The Internal Israeli Political Scene, which is the first section of chapter two of The Palestinian Strategic Report 2014–2015, edited by Dr. Mohsen Mohammad Saleh. The Arabic version of this Report was released in 2016, and the draft of this chapter was written by Dr. Johnny Mansour. This study discusses the instability of Netanyahu’s third government, its dismantle before the end of the 19th Knesset term, and the participation of various political parties in the 20th Knesset parliamentary elections. This section talked about the racist laws, and the corruption cases concerning a number of Israeli politicians and prominent leaders. It discussed the prosecutions and political strictures; the election of the new Israeli President Reuven Rivlin; and the repercussions of the Israeli aggression on Gaza Strip. Finally, it weighs the possibility of several scenarios of the future of the Israeli political scene. This study is the approved English translation of the Educational Indicators, which is the third section of chapter seven of The Palestinian Strategic Report 2014-2015, edited by Dr. Mohsen Mohammad Saleh. It is a statistical and analytical study of various educational indicators in the West Bank and Gaza Strip in 2014-2015. The Arabic version of this Report was released in 2016, and the draft of this section of this chapter was written by editorial team at al-Zaytouna Centre for Studies and Consultations. This study discusses the general educational and cultural situation in the West Bank and Gaza Strip. It provides various data concerning basic, secondary and university education, whether concerning schools, universities, students, or teachers. This study is the approved English translation of the Economic Indicators, which is the second section of chapter seven of The Palestinian Strategic Report 2014–2015, edited by Dr. Mohsen Mohammad Saleh. It is a statistical and analytical study of various economic indicators of the Palestinian society in 2014–2015. The Arabic version of this Report was released in 2016, and the draft of this section of this chapter was written by Dr. Moein Muhammad ‘Atta Ragab, professor of economics at Palestinian universities in Gaza Strip. This study discusses the growth of Palestinian gross domestic product (GDP), GDP per capita, general government debt and budget. It analyzes work and unemployment conditions, trade, and the development of industrial and agricultural activities. This section also discusses how much various external sources have contributed in financing the Palestinian Authority (PA), and it tries to forecast the PA economic performance up to 2017. This study is the approved English translation of the Demographic Indicators section of chapter seven of The Palestinian Strategic Report 2014–2015, edited by Dr. Mohsen Mohammad Saleh. It is a statistical and analytical study of various demographic indicators of the Palestinian people in 2014–2015. The Arabic version of this Report was released in 2016, and the draft of this section of this chapter was written by ‘Abdullah ‘Abd al-‘Aziz Najjar, the director general of the Censuses Directorate in the Palestinian Central Bureau of Statistics (PCBS) in Ramallah. This study discusses the numbers of Palestinian population worldwide, demographic characteristics of Palestinians in the West Bank, Gaza Strip, the 1948 territories and Diaspora, in addition to the refugees’ status. It also studies the demographic growth trends, and reports the different events and activities held by the Palestinian Diaspora that assured the importance of preserving the right of return. This study is the approved English translation of chapter four of The Palestinian Strategic Report 2014–2015, edited by Dr. Mohsen Mohammad Saleh. It is an analytical study of the impact of changes in the Muslim on the Palestinian issue in 2014–2015. The Arabic version of this Report was released in 2016, and the draft of this chapter was written by Dr. Said al-Haj, Dr. Talal ‘Atrisi and Wael Sa‘ad. This study reviews the most prominent roles played by the Organization of Islamic Cooperation (OIC) during the years 2014–2015. It overviews the stances and roles of Turkey and Iran vis-à-vis the Palestinian issue, public and official action in Malaysia and Pakistan, and economic relations maintained by some Muslim countries with Israel. This study is the approved English translation of chapter three of The Palestinian Strategic Report 2014–2015, edited by Dr. Mohsen Mohammad Saleh. It is an analytical study of the impact of developments in the Arab world on both the domestic Palestinian scene and regional dynamics in 2014–2015. The Arabic version of this Report was released in 2016, and the draft of this chapter was written by Mr. Hasan Ibhais. This study discusses the impact of Arab world transformations on the Palestinian issue and the role played by the League of Arab States in this context. It explores the stances and roles of some key Arab countries towards the Palestinian issue, where some of those underwent internal transformations like Egypt and Syria, while Jordan was the most stable. As for the Gulf countries, their interaction with different developments in the Arab world in 2014 and 2015 showed further distraction from the Palestinian issue since the beginning of the Arab Spring in 2011. The chapter also studies the economic relations between Israel and the Arab countries in general, where there was an increase in the trade volume between Israel and its three most prominent Arab partners (Egypt, Jordan and Morocco). As for the Arab public position towards the Palestinian issue, the study reveals that the position of the Palestinian issue among priorities had retreated compared to the prevalence of internal affairs in different Arab countries. This study is the approved English translation of chapter five of The Palestinian Strategic Report 2014–2015, edited by Dr. Mohsen Mohammad Saleh. It is an analytical study of the impact of changes in the international situation on the Palestinian issue in 2014–2015. The Arabic version of this Report was released in 2016, and the draft of this chapter was written by Prof. Dr. Walid ‘Abd al-Hay. This study tries to extrapolate various data on the international behavior vis-à-vis the Palestinian issue to 2016. It discusses the performance of the Quartet, This chapter assess two dimensions: constant elements of the international scene on one hand, and the variables on the other, considering their impact on the Palestinian scene. It discusses the major roles played by the Middle East Quartet, UN, US, EU, BRICS, Japan and Amnesty International regarding the Palestinian issue during 2014–2015. The study is available in Pdf format & the first pages are also available in HTML format. 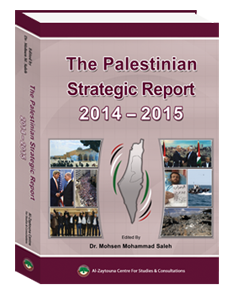 This study is the approved English translation of chapter one of The Palestinian Strategic Report 2014–2015, edited by Dr. Mohsen Mohammad Saleh. It is an analytical study of the internal Palestinian political situation during 2014–2015. The Arabic version of this Report was released in 2016, and the draft of this chapter was written by Mu’min Bsiso. This study tries to extrapolate the internal Palestinian political situation during 2014–2015. It discusses the performance of governments in Ramallah and Gaza Strip, Palestinian reconciliation files, the relations of Palestinian factions and organizations, issues of Palestinian security forces and their performance, in addition to the repercussions of the Israeli aggression on the Gaza Strip in 2014.